Plant the pointy end up. That's about all you need to know. It's easy to spot the pointy end of a tulip; tougher with a crocus. But in most cases, even if you don't get it right, the flower bulb will still find its way topside. 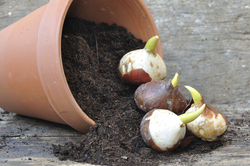 Plant bulbs about x2 the width of the the bulb (from the top of the bulb) deep when planting at high altitude. 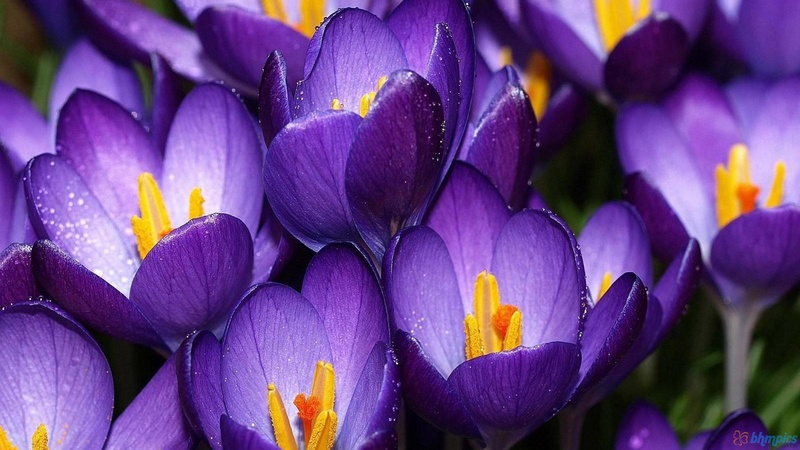 Otherwise, if you plant them much deeper, your bulbs may never come up for spring! No fertilizer is necessary for the first year's bloom. Bulbs are natural storehouses of food. They don't need anything to flower the first year. For bulbs that are intended to naturalize or perennialize (return for several years) or for bulbs that are coming into their second year, spread an organic fertilizer such as compost or well-rotted cow manure, or a slow release bulb food on top of the soil. Narcissus is a genus of mainly hardy, mostly spring flowering, bulbous perennials in the Amaryllis family, subfamily Amaryllidoideae. 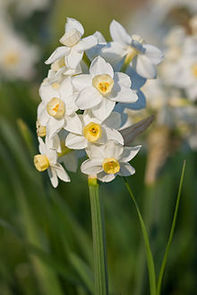 Various common names including daffodil, narcissus, and jonquil are used to describe all or some of the genus. They are native to meadows and woods in Europe, North Africa, and West Asia, with a center of distribution in the Western Mediterranean. The number of distinct species varies widely depending on how they are classified, with the disparity due to similarity between species and hybridization between species. The number of defined species ranges from 26 to more than 60, depending on the authority. Species and hybrids are widely used in gardens and landscapes. Rabbit and Deer resistant, and thus a Park City mainstay. Allium hollandicum, common names Persian onion or Purple Sensation, is a plant species native to Iran and Kyrgyzstan but widely cultivated as an ornamental because of its large umbels of attractive purple flowers. It is reportedly naturalized in Saint Louis County, Minnesota. 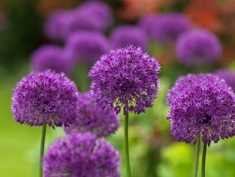 Allium hollandicum is a bulb-forming perennial with scapes up to 90 cm tall. It has long, flat, strap-shaped leaves up to 60 cm long. Umbels are large and spherical, up to 25 cm in diameter, with many purple to reddish-purple flowers. ​Rabbit and Deer resistant. Tulips are spring-blooming perennials that grow from bulbs. 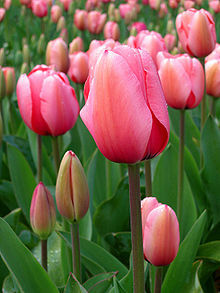 Depending on the species, tulip plants can be between 4 inches (10 cm) and 28 inches (71 cm) high. The tulip's large flowers usually bloom on scapes with leaves in a rosette at ground level and a single flowering stalk arising from amongst the leaves. Tulip stems have few leaves. Larger species tend to have multiple leaves. Plants typically have two to six leaves, some species up to 12. The tulip's leaf is strap-shaped, with a waxy coating, and the leaves are alternately arranged on the stem; these fleshy blades are often bluish green in color. Most tulips produce only one flower per stem, but a few species bear multiple flowers on their scapes (e.g. Tulipa turkestanica). The generally cup or star-shaped tulip flower has three petals and three sepals, which are often termed tepals because they are nearly identical. These six tepals are often marked on the interior surface near the bases with darker colorings. Tulip flowers come in a wide variety of colors, except pure blue (several tulips with "blue" in the name have a faint violet hue). Watch out for planting in areas exposed to wildlife -- deer, moose and others LOVE to eat tulips. Muscari is genus of perennial bulbous plants native to Eurasia that produce spikes of dense, most commonly blue, urn-shaped flowers resembling bunches of grapes in the spring. The common name for the genus is grape hyacinth(a name which is also used for the related genera Leopoldia and Pseudomuscari, which were formerly included in Muscari). Other common names are baby's breath and bluebell, although these are also used for other plants, particularly Gypsophila and Hyacinthoides (respectively). A number of species of Muscari are used as ornamental garden plants. ​Rabbit and Deer resistant.